Jude Zilliox, who will compete at the State Golf Tournament, won a silver medal at the 2018 USA Games. More than 100 Special Olympics Kentucky golfers and Unified partners will hit the course that day. The event provides opportunities for golfers of all skill levels. Beginner golfers and golfers not yet ready for a full round will participate in the Skills Competition, which measures their ability to complete six different common golf shots, with points awarded for accuracy on all shots and for distance on wood and iron shots. Most of the State Tournament’s participants take part in the 9-hole Unified alternate shot competition. The format pairs a Special Olympics golfer with a partner who does not have a disability, and they take turns playing the ball from where their partner last hit it. The most advanced golfers will compete in the 9-hole stroke play event, where Special Olympics golfers will play their own ball throughout. Among the golfers competing this year are USA Games medalists Jude Zilliox and Wake Mullins. Zilliox earned a silver medal in the 9-hole Unified competition a the USA Games in July. 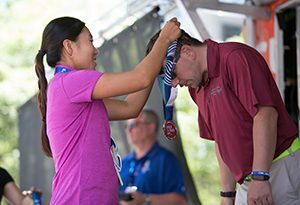 Mullins claimed a bronze in the Unified 18-hole Alternate Shot event. His Unified partner at those Games, Dennis Gaines, recorded a hone-in-one at the USA Games. Mullins is moving up to individual play this year. Gaines will serve as his caddie. All competitors at the State Tournament qualified by playing in one of three regional tournaments that are held throughout the state in July and August, including our first ever golf regional in western Kentucky. The State Golf Tournament will get underway with a shotgun start at 3 pm. The event concludes with dinner and an awards presentation that starts at approximately 5:30. For more information concerning the State Golf Tournament or the Special Olympics Kentucky golf program, contact Amanda Wade at 800-633-7403 or via e-mail at awade@soky.org.